ATP Electronics today announced the addition of its ProMax family product line with the release of its highest performance ProMax CompactFlash memory cards. With a blazing speed rating of 150X, the ATP ProMax CompactFlash card is the fastest CF card available on the market today. ATP will showcase their new water & shock resistant ProMax CF card product line at the CES 2006 January 5-8 in Las Vegas, at the Sands Expo booth # 71440. The complete ProMax CompactFlash card lineup will be initially available through ATP distribution partners Ingram Micro, BKA, and D&H while end users can buy the card direct at the ATP website. Just like ATP's high performance ProMax SD card introduced a few months ago, the newly introduced ProMax CompactFlash card is water resistant and extremely shock resistant. In addition, the ProMax CompactFlash card also features a 30MB/s data transfer speed for fastest file transfers and seamless multimedia streaming. 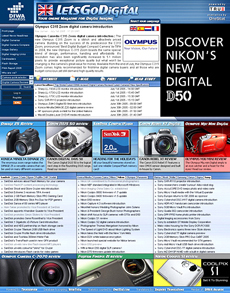 This feature is especially required in professional and high-end prosumer level photographic applications. "Our ProMax CompactFlash card is perfect for today's SLR digital cameras that capture video in addition to digital still images," said Tim Hsieh, ATP President. 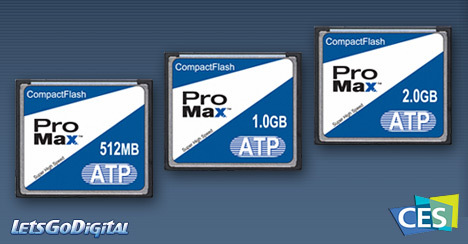 ATP ProMax CompactFlash cards - "The ATP ProMax CompactFlash cards can keep up with a camera's video recording mode as well as continuous shooting mode in still image mode. The resulting benefit to the consumer is that he or she can continue capturing content without fear of performance or quality degradation. This new ProMax CF cards nicely complement our existing ProMax SD and MMC cards, and our high speed ToughDrive USB 2.0 flash drive product line." The entire ATP ProMax CompactFlash card lineup offers the same advanced features as ATP's other flash card products allowing for ample protection from water, dust, ESD (electro-static discharge), and extreme temperatures ranging from -40C to 85C. The ProMax CompactFlash line of cards are specially designed to work with high mega-pixel digital SLR cameras and video camcorders such as Nikon Digital SLR cameras D2X, D2H, D200, D100 and Nikon D70, as well as Canon EOS series SLR cameras and others from JVC, camcorders or Konica Minolta Maxxum 7D cameras. This allows for versatility and durability rarely found today in flash memory cards. The ProMax CompactFlash cards will be available worldwide starting January 2006, in capacities from 256MB, 512MB, and 1GB to 2GB. ProMax 4GB CF will follow in by end of Q1. For more details please visit ATP website.